Congratulations to Jordan Brown and Dylan Pennell, December Student of the Month. Read more about these outstanding seniors. Jordan Brown is the 17-year-old daughter of Jane and Donald Brown. She is ranked sixth in her graduating class with an overall 4.0 GPA. Jordan is active in many aspects of high school. She is a member of the Mighty Tiger Band where she has been a clarinet section leader since her junior year, is an active member of the National Honor Society, participates in several UIL Academic events, is a Link Crew leader, and participates in the Gifted and Talented program. 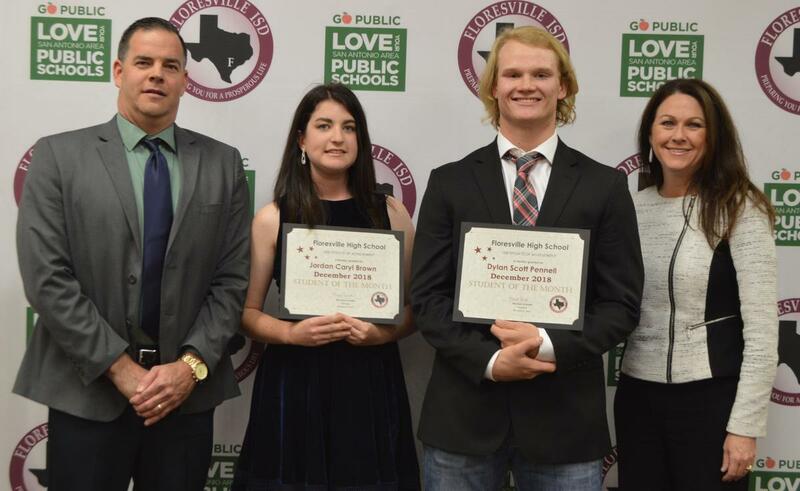 She has been in the Symphonic Band since her freshman year, received the Perfect Attendance award, the Pre-AP English II award, and the dual credit US History award. In addition to her activities at school, Jordan participates in her church ACTS group, the church choir and volunteers at Vacation Bible School as the music leader each summer. She babysits in her spare time and works as a kindergarten aide at South Elementary through the FHS Work-based Learning program. Jordan has been accepted and will attend the University of Texas at Austin where she will major in Psychology. Her strengths are: Strategic, Adaptability, Communication, Positivity and Connectedness. Dylan Pennell is the 17-year-old son of Stacey and Bill Pennell. He is in the top quarter of his class with an overall 3.98 GPA. Dylan is a member of the Varsity Tiger Football and Baseball teams. He is an active member of the National Honor Society and an active member of his church youth group. He has taken all advanced classes since his freshman year including dual credit courses; he has been on the All A Honor Roll. Dylan has received the Lamar Award, and participated on the FHS Tiger Football Leadership Council. When not busy with academics or athletics, Dylan works as a welder’s assistant as well as an event assistant. During the school day, he works as a kindergarten aide at South Elementary through the FHS Work-Based Learning Program. Dylan plans to attend either Texas State or Texas A & M where he would like to major in Criminal Justice while playing baseball at the collegiate level. Currently, he has a few schools interested in him. His strengths are: Restorative, Belief, Responsibility, Achiever and Positivity.